Join us for a séance of interactive, immersive performance born under the umbrella of the Theatre of Testimonies - a new theatrical form that relies on raw and unmediated depositions. The cutting-edge artistic practice, set up by the creative duo Anca Doczi and Cristian Luchian, reflects on matters of identity and belonging starting from the live stories of four Romanians living in London. Intimate and exploratory, with no written script, 'Memodrome: Home' invites personal connection and interaction as wandering in a museum filled with real people whose thoughts and memories await discovery. The performance will transform you from the classic spectator of traditional theatre into a protagonist, able to influence the narrative and decide the course of the performance by listening, asking questions, and sharing your own experiences. Imagine visiting a museum and finding a gallery of real humans where you can immerse into their memories and discover things that may be revealed only to you! 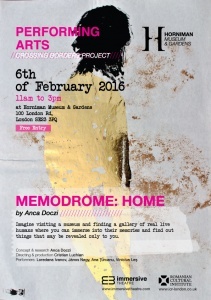 'Memodrome: Home' is part of Crossing Borders, an annual celebration of local communities at Horniman Museum and is organised in partnership with the Romanian Cultural Institute in London.